The objective of the cold test to the determination of the ability of components, equipments, and samples to be used, stored or transported at high temperature. Standard applicable for this test are IEC 60068-2-2. This standard deal with Dry Heat Test for non-heat-dissipating and heat dissipating specimens. 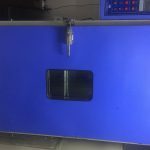 URS have state of the art test facility for Dry Heat Test Comprising Hot Air Ovens of different size with temperature range upto 150˚C and variable ramp rate.